I have updated the Scalomat (for previous version see: http://music-interface.com/?p=64). Scalomat is a scale dependent keyboard for note entry. In its actual version Scalomat fits the number of the pads per column automatically to the number of notes per scale and the vertical number of pads to the number of octaves. Keynote and lowest octave can be set separately. Beneath 15 standard scales selectable via drop down menu Scalomat also contains a custom scale that can be set on a little keyboard. Keyvelocity can be set on the big fader on the right or it can be a random value between two ends of a Rangeobject. 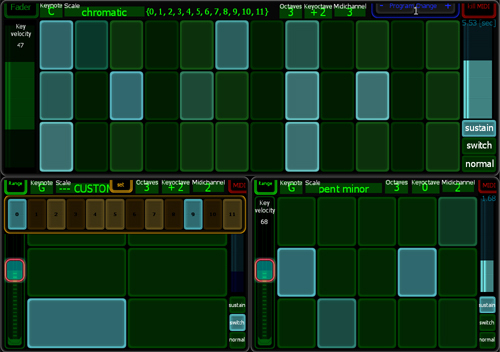 Midichannelselection on drop down menu and additional Kill Midi switch (for accidently hung notes). 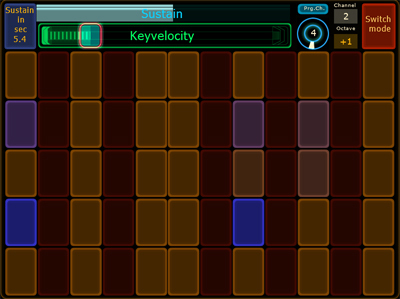 3 Playstyles for Pads: “normal” – direct note on/off by touch; “switch” – switch notes on and off; “sustain” – sends delayed note off message indicated by release time on pad and controlled with a slider (0-15 seconds). Playtypes combineable during play. And finally a little Programm change module for selected Midichannel. During the last week I did some tests with the new Lemur for Ipad App from Liine. Great! Nearly everything works out of the box and colors and shapes on lemur look so bright…. 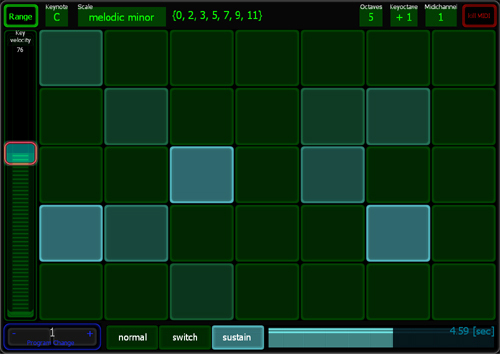 The app is out for about a week now and I ve already started to resize my modules to Ipad resolution. I will upload them soon to the new Liine user Library. Sequencomat is also working, here I show version 3lite. Well, visual feedback is less fluent as on original lemur as you can see in some parts of the video, but at all it works. Next I will try the full version 3.3…. Any feedback is highley welcome! Claviamat is a 5 octave 12 tone chromatic keyboard. You can download Claviamat in the Jazzmutant User area. Sure – I still prefer a normal hardware midikeyboard…. but sometimes midikeys on the lemur are nice. Switch mode let you turn notes on and off. Sustain adds some notelength after you leave the pad. you see it in the glowing pad lights. You can add them to any of your Projects…. Sustainlength (0-10 seconds) controlled by blue horizontal fader. Claviamat (Claviature + mat) is based on Scalomat (a 7 tone masterkeyboard with adjustable scales). A colaboration of ambient songs I did during the last time. “Morton Noto” is a live performed ambient song on the Lemur, using my SequencomatV3 and Scalomat. The song is inspired by the work of Morton Feldman, John Cage and Alva Noto. These names were dropped in talk with Paul Connolly ( www.brightbluebeetle.com/ ), one of my customers, while talking about his perfect setup. So I sit there on a sunday morning and listend to the work of these great artists… and was deeply impressed. After that I decided to put these fresh input into a song. Of course I wouldn´t mess up with these guys….it was just a source of inspiration.